Professor Sycamore is the card that I picked as the most influential card lost to rotation and so is the Pojo’s top pick of their top 10 cards lost to rotation. I guess I can include Professor Juniper as well since she does the same thing even though she was rotated out in September 2015. They both have the effect of discarding your hand and draw seven cards, just like what Base Set Professor Oak did, except both Professors are Supporter cards while Professor Oak was an item card and can be used as many times as you like during your turn. It was reviewed only once by the crew as a regular review that could’ve taken the #1 spot of XY Base Set (https://www.pojo.com/COTD/2014/April/8.shtml). As for Professor Juniper, she got two dated reviews: as a regular review (there weren’t any top 10 cards of the set at the time until BW Next Destines, but I would have her as my top pick) and the 4th best card of 2011 (https://www.pojo.com/COTD/2011/Apr/11.shtml) (https://www.pojo.com/COTD/2011/Dec/1-3.shtml). I remember back in 2011 when I saw Professor Juniper had the same effect as Oak, but as time passes, I realize that moment of excitement turned into something that I must keep and not trade it away because players needed a playset. So why is this card the most heavily missed card and that we probably won’t see one like this for a very long while based on cards that we saw on various Sun and Moon expansions? Enter Professor Juniper, and the perspective of Supporter cards has completely changed. No longer decks needed search related cards, they just passed the responsibility to item cards. You’ll see deck’s with 4 Professor Juniper, 4 N, and maybe some Professor Oak’s New Theory when it’s still legal. Do you still see other search Supporter cards? Nope. No Professor Elm’s Training Method and Sage’s Training isn’t here either. The deck need something fast, even it it nets you seven random cards; you will eventually get the card that you’ll need. Sure, the discard hurts, but learning how to minimize that pain makes it not too much of a drawback. Something like using your current cards that you have for that particular turn such as Ultra Ball, recovery items like Super Rod, Pokemon Tools, and/or energy attachments before playing that Juniper down because cards are going to be discarded anyways, even if you didn’t play it. There’s a lot you can do with seven cards: manual energy attachments, putting Pokemon into play, evolving them, using as many item cards as you like that could get you even more cards, and others. Even ability based draw didn’t see as much play for fear of being captured up front via pre-errata Pokemon Catcher and getting OHKOed. Electrode (BW Plasma Freeze) had Magnetic Draw that draw cards until you have four cards in your hand, and yet that wasn’t enough to see play. Delphox XY was better, drawing until you have six cards in your hand, but she’s a Stage 2. Octillery, on the other hand, is a Stage 1 that draw cards until you have five cards in your hand, and this was seeing lots of play than the other two. So what will happen when Professor Sycamore leaves Standard? Well, we got Cynthia for shuffle based draw, but probably the next straight draw card would have to be Sophocles, Looker, Professor Kukui, Sightseer, or Hau. Sophocles makes you discard two cards in order to draw 4 cards while Hau is your typical Cheren/Tierno of drawing three cards. Looker draws three draws from the bottom of your deck, which would be handful in a few decks like Oranguru’s Resource Management. Professor Kukui draws 2 cards, but also boost damage output by 20. The new Sightseer card may act like a weaker Sycamore, drawing cards until you have five cards in your hand after discarding as many cards as you want from your hand. With crazy draw power out of the picture for the Sun and Moon-on format, the pace will finally start to slow down a little. As for Expanded, however, professors will continue to see heavy play because it will remain legal there forever, as far as Expanded goes. That format won’t rotate expansions, but will aggressively monitor and determine which cards are unhealthy for the metagame. So far, three cards have been banned in Expanded: Forest of Giant Plants, Lysandre’s Trump Card, and Archeops from Noble Victories. So it looks like they’re doing a good job on keeping the format healthy. I don’t think Sycamore or Juniper is going to be banned, but if it does, then it leaves a lot of room of other Supporters to be considered using. Notes: Professor Sycamore will be missed, that’s for sure. He and Juniper had an amazing 7 year run with their effects, and unless we have something in Sun & Moon that replaces them or fills in the gap, I fear we won’t be going to have a card like this for a long time. At the same time, I’m glad their gone, because Standard will open up to other Supporters who has a reason to see play due to their unique effects, even if it’s outclassed. This card barely secured first place with 104 points, beating N by ONE point! That probably could go either way, since both of them were run in lots of decks. Wrapping up this countdown also means be bid farewell to the remains of XY and their archetypes and other cards we didn’t mention in this countdown. The EX, Mega Evolution, and the Break mechanic will be retired from the Standard format. The Sun & Moon onwards would be similar to the ex-era from Ruby & Sapphire but with some added twists: GX Pokemon acting similar to old ex-era cards, Prism Star cards, modernized pseudo-reprinted cards from ancient expansions, and no “dump your hand & draw 7” style variants. Well, looks like I don’t have to rewind back in time; I can experience 2018 as if it was 2003! For the first time in seven years, the format will no longer have discard your hand and draw seven cards. Sycamore entered the format in the XY Base set, but before him we had Professor Juniper. The format has known dump and draw seven since April of 2011, and it’s departure leaves a hole in the majority of our decklists. So what are we going to do? What do we have to pair with Cynthia? There’s always Drampa GX and Hala, that combo has worked GREAT for me. That combo will work great in Rayquaza too I’m sure, only problem is there are a lot of other really good GX attacks for dragons. Fire decks will have the most broken draw support card ever coming out of Dragon Majesty – which yes means Blaine’s Explosive Battle will be around for three entire years… so get used to Fire decks being relevant for a LONG time. We still have Sophocles, Lillie, and Judge, and we have more Pokemon with abilities to draw cards than ever before in the time I’ve been playing. Pair those Pokemon possessing draw abilities with Magcargo, and suddenly maybe we don’t need as many draw Supporters. And if you’re really desperate, you can run a copy of Plusle from Celestial Storm and most likely get yourself a handful of cards for your next turn. So yes we’re losing Sycamore, but Pokemon has left us with a wide variety of alternatives. We’re just going to have to think a little differently than we have over the past seven years. Not that you need stats to tell you that this was one of the best cards in the game, but between May 19th and June 23rd you could find Professor Sycamore in 94% of top finishing decklists, and it was the fourth most common card overall, although it did fall to the second most popular Supporter card during this timeframe, surpassed by Guzma. All I can say about this card is that when I went to build a deck, the first thing I almost always did after selecting my Pokemon was to go to the Trainer tab and type “Sycamore” into the Search field. Farewell, Professor Sycamore, I’m sure in the years to come we’ll reminisce over your half of the discard and draw seven era with fond memories. Yesterday was N, a card so good at disruption and drawing cards that it basically held its value over the course of many years in Standard. If anything, it’s surprising that it managed to keep coming back after all that time. Today’s card has been around for about as long, if not longer. Professor Sycamore, or as he used to be called “Professor Juniper” and long before that “Professor Oak”, is a Supporter that gets rid of your hand and draws you 7 cards. No other card comes even close to that. Even N can only draw you a maximum of 6 cards, and that’s entirely based on your Prize count. Sycamore, or “Sycaper” as I called it during that period when both Juniper and Sycamore were legal but you could only use one or the other, was a deck staple, and it’ll remain a deck staple for many players in Expanded. There’s really no downsides to a card like Sycamore. Even the downside of discarding what remains of your hand isn’t that bad, if what you have in your hand is either cards you want in the discard pile or you don’t have a hand at all aside from Sycamore. No other Supporter can quite replicate that kind of overwhelming advantage. Arora Notealus: It’s hard to say when the next time a card like Sycamore/Juniper will enter the Standard format again. It’ll likely be when the creators want to introduce a faster element to the game again. For now, the best Supporter in Standard will be Cynthia for a while, since without either N or Sycamore, she’ll net you the most cards and bring you the most advantage for a while. Behold the reign of the 4 Cynthias! Side Review: Yveltal-GX – despite its EX brethren being a powerful force to be reckoned with, Yveltal-GX is a tremendous downgrade of sorts, and that’s considering its GX Attack can KO things. Absorb Vitality needs boosts to be effective, Sonic Evil is just okay but pales by comparison to other Yveltal attacks, and while it’s tempting to build around Doom Count GX, you shouldn’t bother simply due to the level of damage manipulation that has to take place in order to center yourself on the KO requirement. Overall it’s too much effort for too little payoff. Hoopa – Hoopa hasn’t seen much play in general, and to be fair, he is a very big tech card. It’s debatable on whether or not he’ll be any good, but depending on what deck he’s apart of, he can actually be very helpful. Probably the most noteworthy deck to put him in might be Silvally-GX decks, as a means of having access to the Memories you need for any particular match-up; this will be especially good when you don’t have massive draw Support from Sycamore, so it should be worth considering in that regard. Save some space on Memories by only running one of each! Xerneas-GX – though he’s about as impactful right now as Yveltal-GX – which is to say, he hasn’t been impactful at all – Xerneas-GX at least has the potential to be a massive pull for Fairy decks. With certain Xerneas rotating out, he might be useful for getting in that early damage, which can set himself up for a massive Sanctuary GX later on. And at least Aurora Horns is a stronger attack than Sonic Evil. Definitely one of the better Xerneas cards at the moment. Weekend Thought: Did you agree with the list? Find that we missed a couple of cards rotating? Think that we should have covered something more? What cards will you miss from Standard? What cards won’t you miss? What decks will you work to fit the new Standard format? Or will you migrate to Expanded to keep your deck intact? Let me begin by mentioning that my review for yesterday did go up, albeit a few hours late. My apologies for the delay and no, it won’t be the last review to be posted late. I love writing, I that you read my writing, but this is a volunteer gig I do for the fun of it; when real life requires more of my time, I have to yield to those demands. Plus, sometimes I’m just an idiot who doesn’t manage his own time well. The best, or at least the most influential, card we’ll be losing from the Standard Format as of September 1, 2018, is Professor Sycamore (XY 122/146; XY – Phantom Forces 101/119; XY – BREAKpoint 107/122; XY – Steam Siege 114/114). 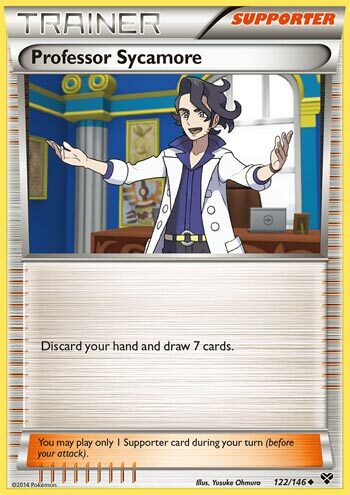 Just because I hate not doing this, I’ll point out that it is a Trainer-Supporter with the effect “Discard your hand and draw 7 cards.” This isn’t a new thing for the game; when Professor Sycamore released, Professor Juniper (Black & White 101/114; BW – Dark Explorers 98/108; BW – Plasma Freeze 116/116; BW – Plasma Blast 84/116) was still legal. Due to the overlap back then in Standard and the continued overlap in the Expanded Format, the game requires a special rule stating that you cannot run Professor Juniper and Professor Sycamore in the same deck. Which seems needlessly confusing; I still advocate issuing an errata for each card, changing the names of both to simply “Professor”, and the regular rules will prevent them from both being used in the same deck and just maybe we can get some Alternate Art releases featuring other professor characters. Why would this be less confusing? It doesn’t happen all the time, but more than once I’ve had to explain to someone that it is only these two that cannot be used together in the same deck; stuff like Cheren, Hau, and/or Tierno are perfectly legal to use together. Moving on, Professor Juniper and Professor Sycamore are more examples of cards that aren’t just good, but which are too good. Discarding your hand is intended to be a big cost, to go with such a big reward. The powers-that-be, however, seem to have done just the opposite; so many cards are designed to lessen this cost. From general examples like Ultra Ball, where its discard cost allows you to empty out your hand for gain before you’d have to otherwise discard it, to more deck specific examples like Malamar (SM – Black Star Promos SM117; SM – Forbidden Light 51/131), with its Ability that wants basic Psychic Energy cards in your discard pile, and many, many more besides these two. A little synergy isn’t bad, but I saved the most obvious way of minimizing the cost of Professor Juniper/Professor Sycamore for last: use all your cards in hand before you play it. “Well, duh!” you might be thinking, or even yelling at your screen because it truly is that obvious… but the reason I have to mention it is that the designers have given us so, so many potent cards that fall into this category. It is good that at least we weren’t stuck with one deck to rule them all… but at the same time this helped decks that ran few or no Evolutions, low Energy counts, high counts of easily used Items, and usually two or all three of these things together, they enjoyed all the advantages that came with such things and then the bonus of rarely feeling the pain of discarding one’s entire hand. Professor Sycamore is a card I’m only going to miss in the same way I miss that second helping of a desert when I actually remember to mind my caloric intake; I may crave it but not only do I not actually need it, its bad for me. It is intimidating knowing we won’t have this staple for Standard Format play soon, but it is somewhat liberating to know that all the cards it overshadowed or completely crowded out of the competitive sphere will be getting another chance to shine. They still may fail to prove worthwhile, but at least they’ll have a better chance than they do now. Professor Sycamore was my personal top pick.